It has been three years since the Assad regime committed the chemical massacre in Ghouta near Damascus in which 1,400 people were killed. In three years very little has changed in the grand scheme of things. The use of chemical weapons was meant to be a ‘game changer’ that would convince the West of Assad’s tyranny once weapons of mass destruction were unleashed. And although a ‘red line’ was declared by Obama to prevent using such uncivilised weapons, this did not stop this criminal regime. The Assad regime has since sunk to the depths of depravity with repeated attacks on civilians using both conventional weapons as well as chemical weapons. In September 2013 a UN sponsored deal was meant to rid the regime of all chemical weapons. This proved to be a farce as the the guilty party was barely disarmed and certainly not made to pay for its crimes. Today Assad and his cronies still use chlorine gas to terrorise their victims, almost 100 years after such weapons were forbidden in war by the Geneva Protocol. This has placed the intentional community in a deeply humiliating position. While one superpower in particular has been backing Assad to the hilt both militarily and politically—Russia—others are still culpable due to their failure to act, their refusal to provide civilian protection and a No-Fly Zone. The Syrian people have long felt abandoned and view the West’s silence as complicity. We hope that ultimately the criminal Assad regime will be held accountable for its actions and that these massacres will not be forgotten. Follow the Syrian Association of Yorkshire on Facebook. 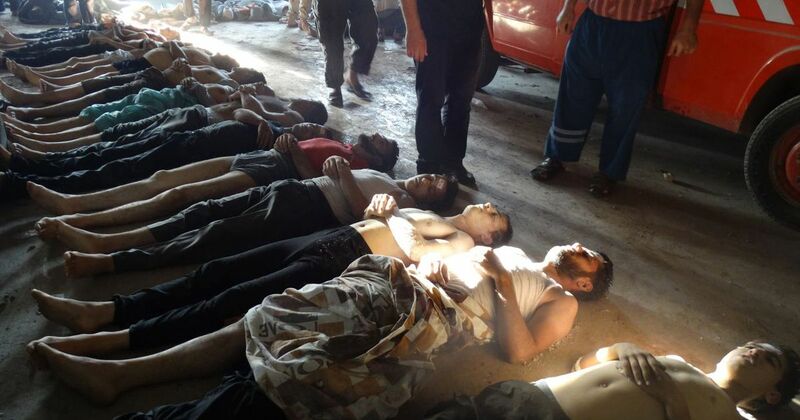 Photo: Bodies of victims of the Sarin chemical weapons attack on Ghouta, Syria on Wednesday 21 August, 2013, via Shaam News Network/AP. Hisham Ashkar gives the identity of the victims in this photograph in his article, The Chemical Massacre in Eastern Ghouta: The Distance Between the Images and the Victims.